Eating Brown Rice Lowers Diabetes Risk? Yet doctors warn that there’s more to this effect than the nutrition in rice alone. Researchers drew on data from over 200,000 subjects and found that those who ate five or more servings of white rice a week had a 17 percent increased risk of developing type 2 diabetes compared with those who rarely ate white rice. 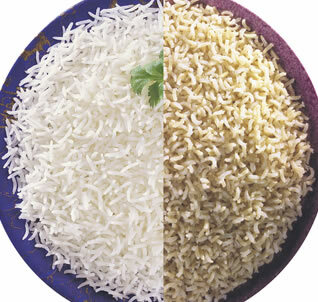 What’s more, they found that those who ate brown rice regularly were overall less likely to develop diabetes. With those results, researchers estimated that subbing in a few servings a week of white rice with brown would result in a 16 percent decrease in diabetes risk. But diet and diabetes experts say these results may have more to do with type of person who tends to prefer brown rice than how the food itself affects health. “Maybe people who eat brown rice are more health conscious,” said Dr. Charles Clark , professor of medicine at Indiana University School of Medicine. Because the study can only gauge associations between lifestyle choices and later disease, it’s impossible to tell whether it’s the rice that makes a difference or some other shared quality among brown rice eaters, he said. Indeed, researchers found that brown rice eaters as a group tended to be more physically active, leaner, less likely to smoke, and perhaps most importantly, had a higher intake of fruits, vegetables, and whole grains — all choices that help lower risk of developing diabetes. “I think whole grains may be the big player and not brown rice alone,” says Carla Wolper, a researcher at the N.Y. Obesity Research Center. But making the switch from white to brown rice may be a relatively painless way for Americans to incorporate more whole grains in their diet, says Dr. Walter Willet, a co-author on the study. This was one of the reasons researchers decided to zero in on this particular grain. Showing that eating whole grains is healthier for you than eating refined grains is nothing new, but given the growing consumption of white rice in the United States and globally, Willett says, this particular diet change is worth looking into. “You’re left with a form of starch that is rapidly broken down, leads to greater spikes in blood sugar, and increases the demand for insulin. Over time this exhausts the pancreas and leads to diabetes,” he said. Doctors largely agreed that a whole grain, like brown rice, is better than a refined grain like white rice or white bread. “The overall consumption of brown rice was relatively low in this population,” said Dr. Carl J. Lavie, medical director of Cardiac Rehabilitation and Prevention at John Ochsner Heart and Vascular Institute in New Orleans. “Instead of consuming high quantities of white rice, it would be preferable to replace this with either brown rice and even better to replace white rice with other whole grains…” he said. Clark said brown rice is high in fiber and “diets high in fiber are protective for a number of risks including colon cancer, obesity, and diabetes.” So adding more whole grains, such as brown rice, is always a good thing. The fact that those who chose brown rice tended to live more health-conscious lives than white rice eaters exaggerated the reduced risk of diabetes seen in the study, but it does not explain it away, Willett said. Could the Brown Rice Alone Change Diabetes Risk? Researchers controlled for the lifestyle choices that may impact diabetes risk, such as overall diet, exercise level, smoking habits, and a family history of the disease. Taking into account all these behaviors, the association between brown rice consumption and a lower risk of diabetes was diminished but did not disappear, said Willett. But those diminished benefits of brown rice alone did not impress all doctors. Feinman said by looking at the study, he’d estimate that 1 person out of 1,000 people who subbed brown rice for white rice would be able to prevent diabetes. Keith Thomas Ayoob, of Albert Einstein College of Medicine, acknowledged that brown rice alone might have an effect on a person’s risk for diabetes and brown rice isn’t a remedy for disease risk. Ayoob said he doesn’t want consumers to think that switching to brown rice could replace the other habits necessary for good health such as portion control, exercise, and overall diet. “I’m all for people swapping out refined grains for whole grains, but the issue of diabetes is more complex than can be seen by this study,” he said.